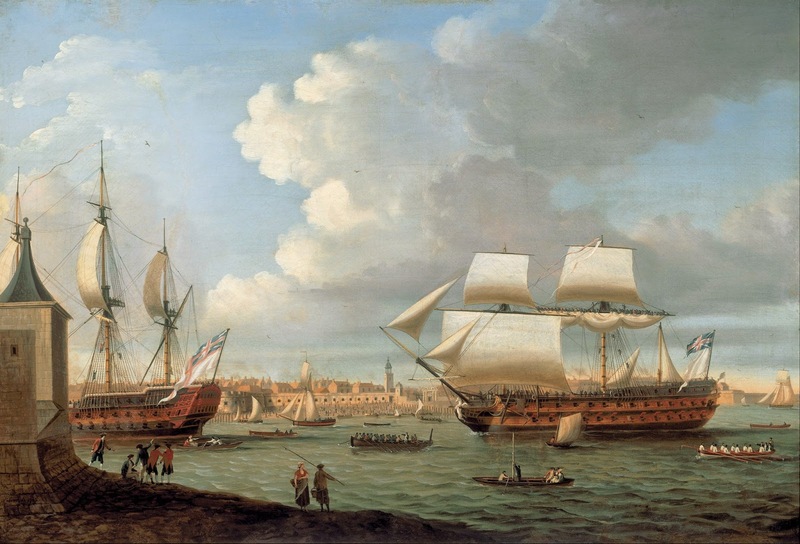 Foudroyant and Pégase entering Portsmouth Harbour, 1782, Dominic Serres, 1782, Google Art. In late April, 1782, British and French squadrons engaged in the Battle of Ushant. This was, in fact, the third Battle of Ushant in the American Revolutionary War. As part of the action, the 80 gun HMS Foudroyant, Captain Jervis, pursued the French 74 gun Pégase, pounding her with punishing broadsides before boarding her and compelling the French ship to surrender. Jervis was wounded in the action and knighted for his leadership and heroism. The scene Serres depicts here is not one of the violent action or the heroics of the crew. It is a calm scene depicting the seized French vessel being towed into port. Her topmasts are gone, and a close look at her sides shows her riddled with holes. Above the white flag of the French flies the King's Colors. A small gathering of boats swarm around the men-of-war to welcome them to Portsmouth. It is difficult to differentiate between watermen and sailors among the various boats. Certainly these oarsmen are naval. Their black barge caps bear a silver device that is likely the crest of the important looking officer sitting in the stern. The oarsmen wear their shirts without jacket or waistcoat, and black neckcloths. Standing tall in the stern is the coxswain, who appears to be wearing a black cocked hat with the point forward. His coat (or possibly jacket) is a sort of grey-brown, but the figure is too small to say much else. 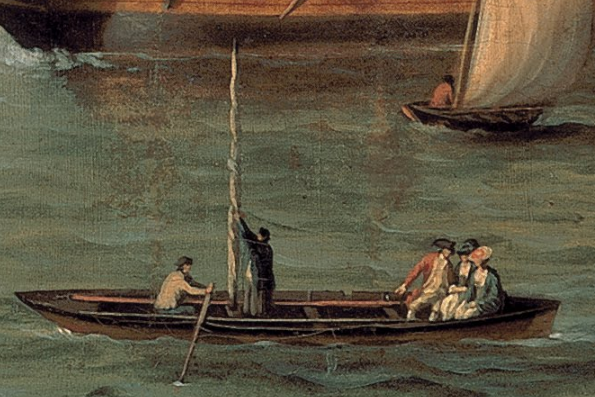 The two tars on the boat here are probably watermen. The fellow at the oars wears a black cap that might be either a knit cap or a round hat with very short brim. He is in shirtsleeves and a pair of blue breeches. His mate (at the single short mast amidships) wears a black cap, blue short jacket that ends at the top of his thighs, and a pair of slops. This boat appears to be a naval one. Standing aft of the oarsmen is an important looking man pointing and posturing in a blue coat, cocked hat, and white small clothes. Taking all of this into consideration, he's probably an officer of the Foudroyant. The boat carries an anchor that is clearly too large for it. It is possible they are carrying it for kedging, but the only two vessels large enough for that to make sense are moving along just fine on their own. Regardless of their purpose, we can say the oarsmen are wearing round and cocked hats, and coats in a wide variety of colors (blue, brown, red, beige, and possibly green). The sailors aboard the Foudroyant and Pégase wear a similar variety of jacket colors, though blue is the majority by far. 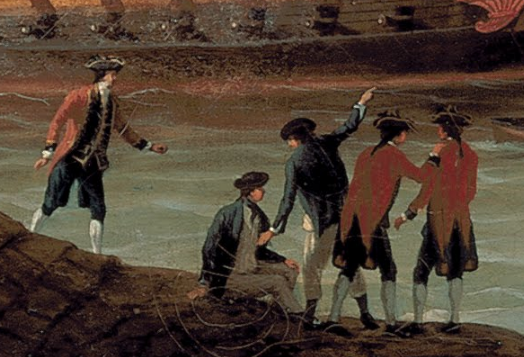 Three soldiers of the Portsmouth garrison stand on the shore in the lower left foreground, beside two tars. These are fairly well dressed mariners, possibly midshipmen or petty officers of some stripe. They could also be common sailors in a fine set of shore clothing slop clothes. They both wear round hats with short brims, blue jackets with mariner's cuffs that are left open, single breasted white waistcoats, and white trousers. The tar on the left certainly wears a black neckcloth, but as his mate is turned away from us we cannot be sure he wears the same.